The village of Killearn, Scotland. Killearn Cottagers' Horticultural Society. Welcome to the Killearn Cottagers' Horticultural Society web pages in conjunction with Killearn.org.uk. Killearn Cottagers' Horticultural Society is a Scottish Charitable Incorporated Organisation, number SC046701. Nowadays we have the same aim but achieve it in different ways. The Society holds a number of meetings throughout the year with invited speakers on horticultural subjects. A fund raising Whist Drive and a Gardeners' Market combined with a Coffee Morning are arranged annually. 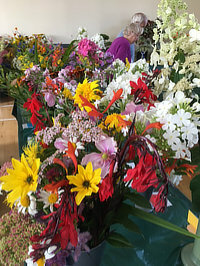 Our main event is still the Annual Flower Show held on the last Saturday in August. This now has an even wider spread in terms of exhibits and exhibitors - the former ranging from traditional flowers, fruit & vegetables, preserves and baking to art, photographic, various craftwork and floral displays. The 153rd Show will be held on Saturday 31st August 2019 in the Village Hall and the Church Hall. Purchase of the Show Schedule entitles all members of a household to enter exhibits in the annual show. We will add show results and pictures soon after the show each year. If you have any ideas for our web pages - contact us - with your suggestions.